It's Friday and my last week as Guest Designer over on the Oak House Studio blog. Not a card this time but a gift idea using Oak House Studio's Oriental Stamps to decorate a Pen Pot and notebook. For all the details head on over to my post at Oak House Studio and remember to comment for your chance to win the Clematis Tower and a background stamp!! Thanks for taking the time to look at my blog and I hope I've inspired at least one person to try the oriental look!! 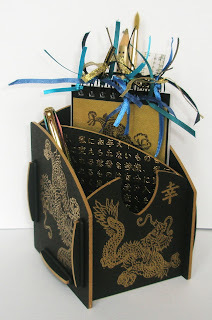 Wonderful project, I love the dragon stamps you have used overthe past few weeks. Going over to takea look at Oak House now. yet another brilliant project Elaine, thank you for being a guest designer on our blog, I hope to see your work back on there again soon.